Take A Quick Survey On First Attempt Garden Edibles For 2010! 2009 was a banner year for seed sales as individuals and families started looking at vegetable gardening as a way to manage tight budgets while improving eating habits. Now a month past winter solstice, daylight hours are getting a bit longer, and 2010 seed and garden supply catalogs are piling up on our night tables. Pink bananas in your edible garden? Before you go “hog wild”, take a reality check with respect to the suitability of those new edibles to your climate, soil type, space requirements, etc. Our “Seven Strategies To Plan Your Vegetable Garden” post might help you out. Garden sorrel “Rumex acetosa” – apparently more popular in Europe than in the U.S. Found this recipe for sorrel soup – it is delish! Tomatillo “Physalis ixocarpa” – we’ll be making lots of salsa out of this and will try it in stews. But one can’t stop at three, right? So here are other less common garden edibles we’ve attempted or thought about cultivating: quinoa (superduper healthy grain), amaranth (beautiful red plants but they needed staking; it was like harvesting sand so a bit tricky), soybeans (don’t you just love snacking on edamame? ), scorzonera/salsify (we hear it’s great in soups), and celeriac (though long days to harvest, it’s so yummy in soups and as a low-carb alternative to mashed potatoes). Now in its own rightful kingdom and no longer classified as plants, edible fungi like oyster mushrooms (Pleurotus species) have been grown in this household. Seed companies like Territorial are getting into the recent popularity of home-cultivated mushrooms and offering cultivation kits for oyster, shiitake, and even more exotic mushrooms like lion’s mane, believed to promote healthy neurological functions! Alright, so you don’t live in a Mediterranean climate, and you’re sick and tired of hearing how we’re harvesting bell peppers in Northern California 😉 . 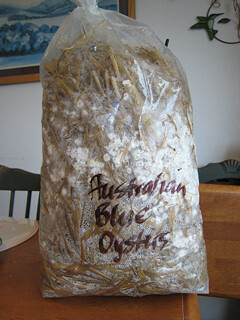 Well here’s a nice little project that you and your kids will love any time of the year: growing oyster mushrooms indoors! I was recently at a “mushroom camp” with the Sonoma Mushroom Association, and among many different lectures and activities, made my own oyster mushroom growing kit. The instructor, Ben Schmid, pasteurized the straw (boiled to at least 180F), and excited, wide-eyed participants like myself stuffed it (using rubbing-alcohol-disinfected gloves) into clean plastic bags (about 2 gal capacity). 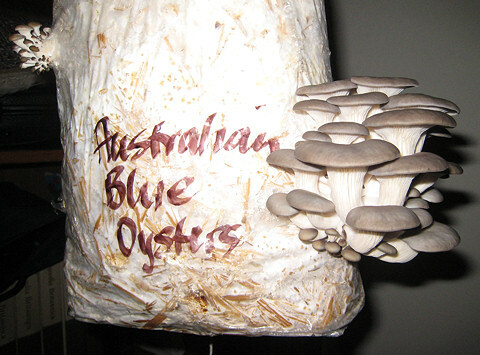 Finally, Ben added oyster mushroom spawn (mine were purportedly Australian Blue Oysters – but there’s nothing blue about them so perhaps I got a different oyster species) into the bags. It took exactly 23 days till I harvested the first bunch. It was kept in our well-lit kitchen that averages 65F throughout the day. Needless to say, it was a THRILL to see the first bunch grow into a dinner-sized portion. We cut them up (leaving the pretty caps intact) and stir fried them with red bell peppers and onions. Delicious! You can purchase mushroom growing kits from many seed companies like Territorial or from sites like Fungi Perfecti (Paul Stamets’ company. See his TED video on how mushrooms can save the world). A white chanterelle in New York? Nope! Nope, not a white chanterelle but a Clitopilus prunulus specimen! Bummer. 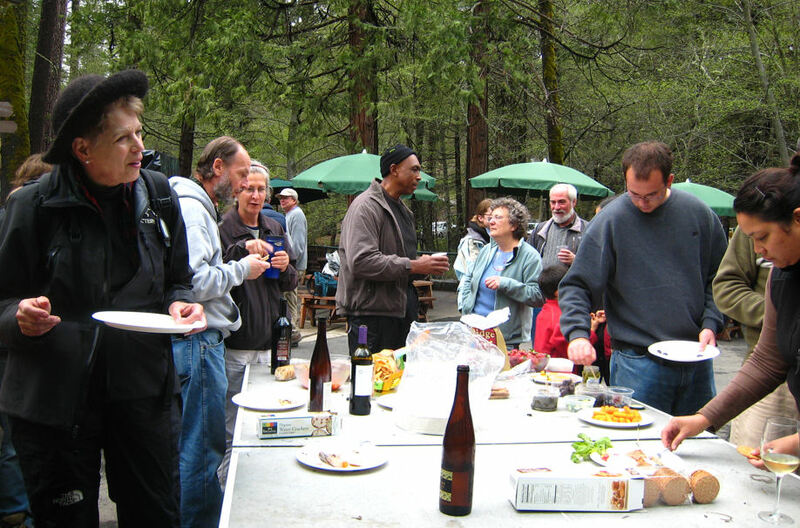 Winter in N. California is a great time for mushroom hunters. We don’t eat any mushrooms we find (and don’t recommend it unless you’ve been trained in the field), but it’s always fun to find fungi on our walks and try to figure out what it is! The one on this photo was not taken in CA but rather in Pound Ridge, NY in July ’08. I came across the white chanterelle (Cantharellus subalbidus) in perusing David Arora’s highly recommended pocket field guide for beginning mycologists in the Western US – All That The Rain Promises and More … and can’t help wondering. It is one of the more beautiful specimens we’ve seen in the field. Gary Lincoff was kind enough to ID this as Clitopilus prunulus also known as the “sweetbread mushroom”. WARNING: Do not eat mushrooms in the “wild” – from your garden, da woods, meadow, or any place else unless you have been educated out in the field with an expert for many years. Due to our inexperience, we do not eat wild mushrooms. Whew! 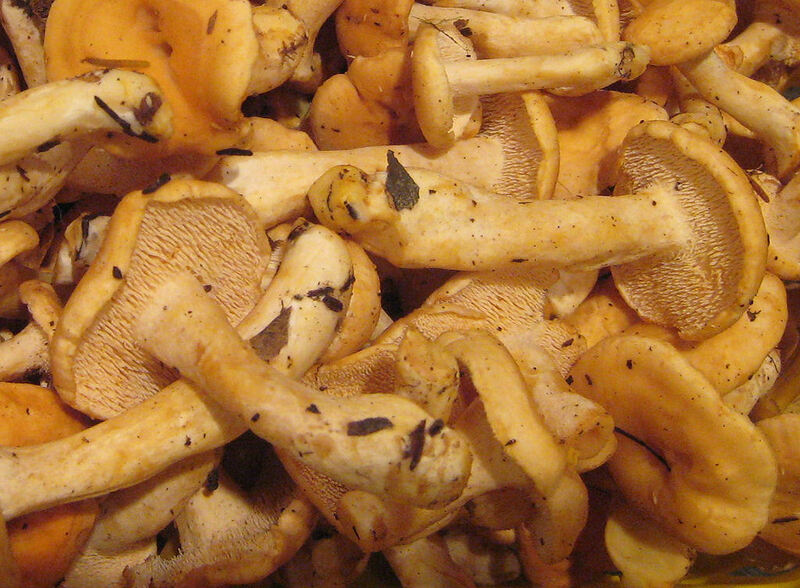 With that disclaimer out of the way, I can tell you about how much I love mushrooms – their appearance, the smell (of most), the way they appear suddenly out of nowhere, and of course, the delicious porcinis and morels. We found these inky cap (coprinus sp.) beauties next to the compost – just like last year. As they mature, the caps spread apart like an open umbrella and start disintegrating at the edges, turning inky black, spreading inward. They’re related to the common (edible, fishy smelling) Shaggy Mane. Coprinus, if ingested even within days of drinking alcohol, will produce alarming reactions (e.g. rapid heart beat, nausea – so bad you feel like you’re gonna die!) so it’s best to admire them and leave it at that. Read this funny anecdote about a guy who fed Shaggy Mane to his girlfriend. Roy wanting to get his grubby hands on morels! 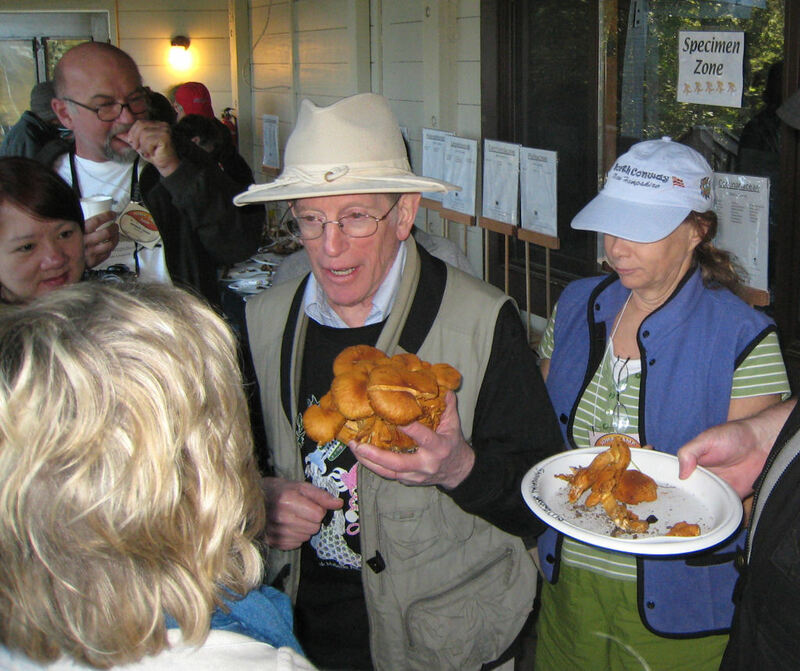 Recalling the foodfest at the January Fungus Fair in Santa Cruz (think mushroom lasagna, candy cap mushroom cookies), Roy and I trekked over the Bay Bridge to the Oakland Museum. The exhibits were excellent and educational … but where was the food? We arrived at 2pm and the one (yes – uno) food station serving soup (just soup?!?!!) was cleaning up. Finito. No mas. We were starving. Later on we learned that the shroom foodies only hung out in Santa Cruz! 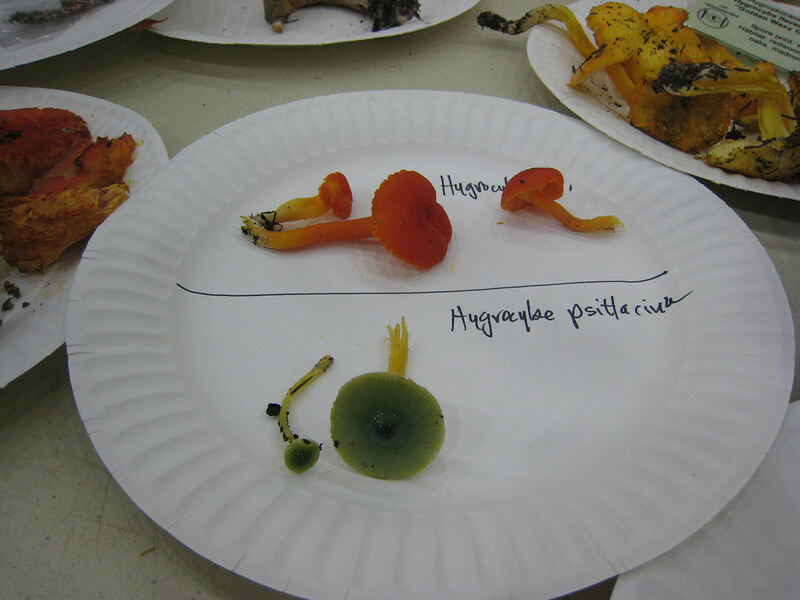 Consolation was learning a bit more about shrooms and discovering a Russula that smelled like shrimp – Russula xerampelina – apparently a choice edible according to the docent! Then bought porcini mushroom broth cubes from Italy (a la Knorr, though noted it contains MSG) and a little $13 baggie of dried morels, enough for 2 meals of chicken/morel risotto!